Last week, my friend and I went job hunting. 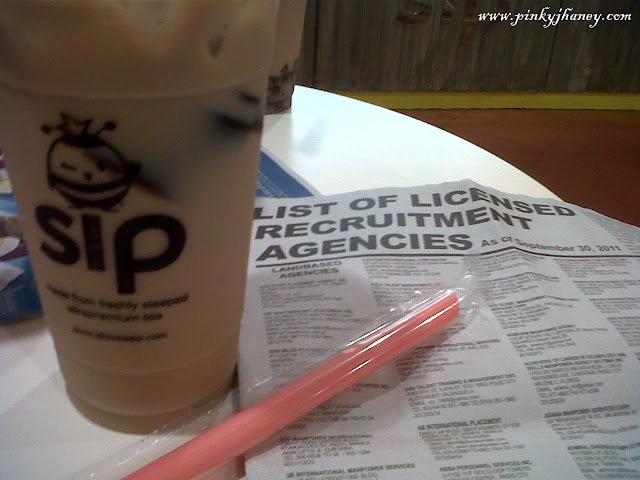 We also dropped by at POEA to check out some job openings for us. In the back of my mind, I'm still torn between choosing my profession or just pursue a business. We all know that nurses are having hard times on finding a job in our country especially when you don't have a backer or "kakilala" in hospitals. I'm not getting any younger anymore so I need to decide which is which. Somehow there's still a part of me who wants to pursue my career as a nurse. I wanted to start a business but something's holding me back. I feel incomplete if I didn't pursue my nursing career but luck is very tough for me in our country. I need some clinical experience before I can go abroad. But I'm still hoping and praying for a miracle. Just a piece of advice for those who are planning to take BS Nursing. If you don't really like it especially when your family or friends just convinced you then think twice. But if you really want it then go for it. Follow what your heart desires. Do not think about how much a nurse would earn abroad. Before that happens, a nurse would undergo a very long process. Lots of trainings, volunteer/clinical experience before they can go abroad. Hindi lang sa nursing ang pera. If you are really good in what you are doing then I believe that you can achieve your goals. Thanks a lot sis. I'm actually thinking about that. I really wanna work in Canada din sana. Mejo takot lang ako magwork sa Saudi kasi marami akong naririnig na horror stories ng ibang nurses din dun. Pero no choice na rin ako kaya baka magtry ako this year mag apply. Sorry to say, oversaturated na tayo sa nurses. But don't lose hope, I'm sure you'll find something that you love and hopefully earn from. Good luck! Thanks a lot. Hopefully makapagdecide na ko by this year.